Over 70 young clergy women from all over the world gathered in Minneapolis, Minnesota just a few weeks ago for the seventh Young Clergywomen Conference. We learned from our wonderful speaker, Rev. Ruth Harvey. We could feel the Spirit’s presence as we worshiped and prayed together. We offered a conference that welcomed children, as well as one that offered childcare. And, of course, we had fun meeting and bonding with fellow young clergywomen! After you see these pictures, we know you’ll want to mark your calendar: our next conference will be held the week of July 5-9 in Austin, Texas! We worshiped together in the chapel at Westminster Presbyterian Church. Who doesn’t like a good sale? The sale table featured extra “swag”, TYCWP “You’re Not the Only One” cards, and imprint books. The “swag” for the conference was AWESOME! Here we are at the keynote session with our speaker, Rev. Ruth Harvey. We participated in some table activities during the keynote session. There is so much we can learn from one another! The prayer service of healing that was held in the Chapel at Westminster Presbyterian Church was a moving experience. The 2014 TYCWP Conference Attendees (including Amy Loving who was Skyped in). This is what clergy women look like! Join us next year! 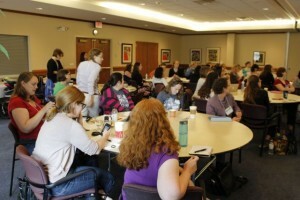 https://youngclergywomen.myworshiptimes31.com/wp-content/uploads/sites/3/2014/07/IMG_2610.jpg 427 640 2014 TYCWP Conference Committee https://youngclergywomen.myworshiptimes31.com/wp-content/uploads/sites/3/2017/05/YCWILogo_Vert_Black-300x229.png 2014 TYCWP Conference Committee2014-07-29 02:00:302014-07-29 02:00:30Images from "Out of the Deep: Pastoring in Creative Space"
I am a Presbyterian pastor serving a UCC church. I am a member of YCW and I am considering attending the 2015 conference in Austin. It would be my first one, and I am extremely excited at the prospect of being among other clergy women. However, I am a bit concerned looking at these pictures that it is a lot of young caucasian women and no women of color. Am I correct in that observation, and if so, why do you think there is trouble drawing a more diverse membership?